Intelligent Nutrients is a premium beauty brand, created on the basis that everything we put in and on our bodies must be nutritious and safe, an ethos that sings to me! Intelligent Nutrients uses scientific technology to create products which are sustainable, effective and a pleasure to use. The brand is certified Organic, Cruelty Free and all Intelligent Nutrient products are created with 100% renewable energy too. Does it get any better? Founder Horst Rechelbacher, a pioneer in plant-based personal care & aromatherapy, began a three-year apprenticeship in the beauty and salon industry at the age of 14. His intuitive talent, creativity and charisma catapulted him to the top of the swinging sixties hair competition circuit. A rock star life followed, leading him to the U.S. where fate landed him in the Midwest. By 1965, he started his own salons and a product line called Horst. Organic agriculture improves living matter in the soil, supports the air quality and builds up nutrition. But because health and beauty companies are trusted to regulate themselves, the words “natural” and “organic” have become a free-for-all. USDA Certified Organic is the only seal that ensures an ingredient or product is truly organic. Anything else or less is marketing. Nutritional chemistry technology and science have evolved so that using non-toxic, natural and organic products doesn't mean sacrificing performance. Intelligent nutrients products are free of sulfates, plastics, parabens, silicone, mineral oil, petrolatum, petrochemical derivatives and synthetics. Instead they are formulated with state of the art science that makes them so potent and high performing. Perfect for those with sensitive skin! 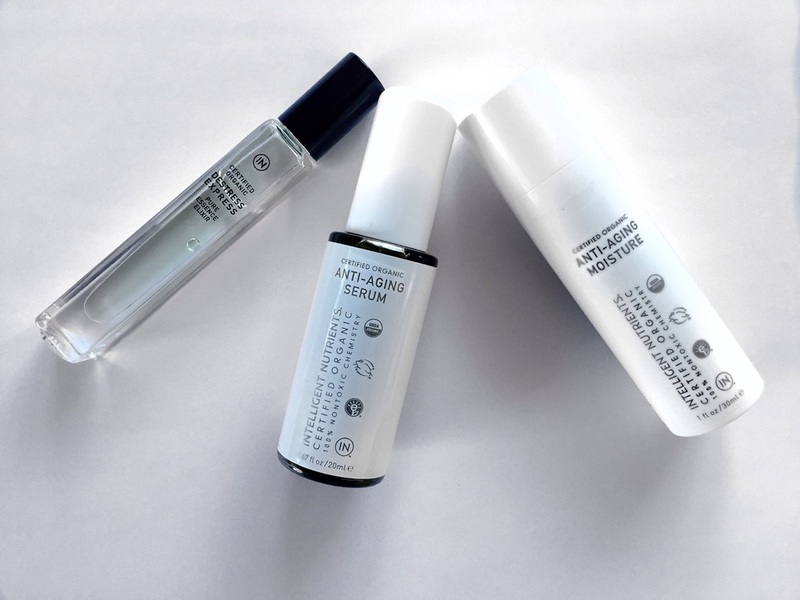 Before using the line I did wonder whether I'd miss the chemical ingredients from a results point of view... Could something entirely plant based really work as well for my skin, especially in the fight against ageing! I've been using the face serum, moisturiser and cleanser now for about 2 weeks and so far so good. I prefer to try skincare out for a full 6 week skin cycle before making any grand announcements but for now I like where we're headed. The serum feels incredibly rich and nourishing and has quite an oily texture where as the moisturiser is light and fluid. A nice balance and choice to have depending on the time of day you apply them, I keep the serum for evenings. My favourite product is the antioxidant lip treatment, a glossy balm that comes in 3 shades and offers a hint of colour. I apply it twice a day and my lips stay hydrated and have yet to get dry coming into the cooler weather. It's important to note that the plant extracts you find in these products are second to none and each product is based on the same foundation. Intellimune® is the super-antioxidant seed blend found in almost every one of Intelligent Nutrients products. It starts with thousands of certified-organic fruit and vegetable seeds packed with even more potential than the plants themselves. Because they are the source of all life, they are cold pressed without chemicals for a potency far greater than the sum of its parts. The results, Intellimune fights off free radicals, reduces inflammation, protects healthy cellular activity and growth and helps to slow unnecessary premature ageing and disease in the process. I love the idea that my skin is getting the nourishment it requires with no scary chemicals to worry about. From revitalising facial serums to anti-oxidising hair care, Intelligent Nutrients is now available in Avoca Kilamc, Suffolk Street and Rathcoole. Join Intelligent Nutrients in Avoca Kilmac on Friday October 2nd between 12-3pm to speak to a brand expert and discover the line for yourself!